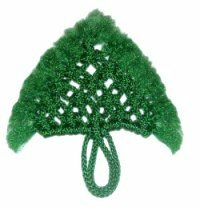 Description: This Tree Ornament can be used to decorate a Christmas Tree, or it can be added to holiday packages, table decorations, etc. 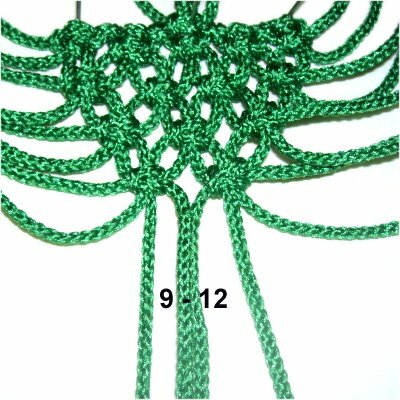 You can use thicker material (4mm - 6mm) if you want to make it large enough for a wall decoration. Make sure you cut the cords longer. 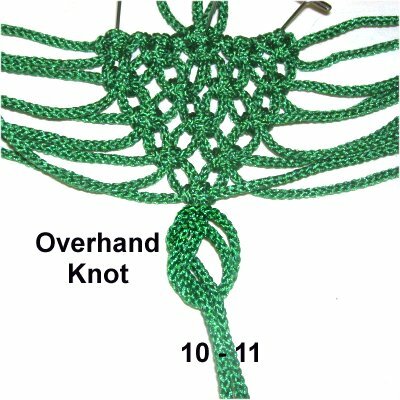 This is a small Macrame project for beginners just learning the Square Knot. It's easy enough for children to make as well. The features include a flat alternating V shaped design, a brushed fringe, and two loops at the bottom representing the "trunk". The finished size is 4 inches tall and 3 inches near the bottom. Step 1: Cut 12 cords, each at least 30 inches long. Fold two cords in half and secure them at the center. Mentally number the 4 segments. 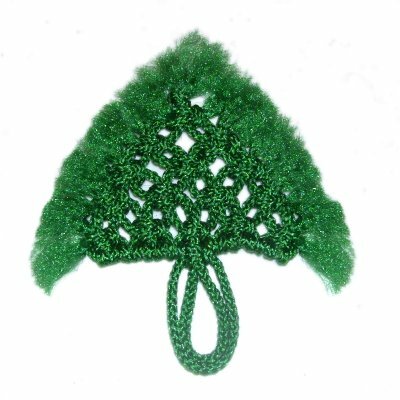 Make the trunk for the Tree Ornament by tying a Square Knot with segments 1 and 4. The fillers are segments 2 and 3. Tighten it 1-inch below the center fold. Step 2: Arrange segments 1 and 4 to the right and left horizontally. They temporarily act as holding cords. 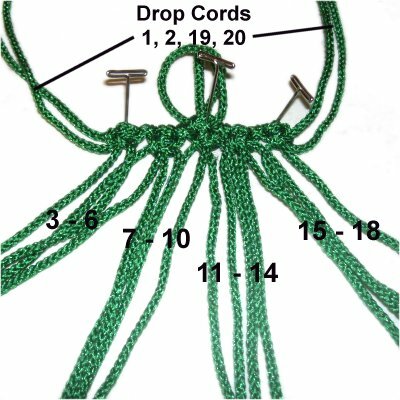 Mount 5 cords onto each holding cord (total of 10) with Larks Head knots. Push all the knots toward the center when you are done. Step 3: Mentally number all the cords, including the holding cords, which are first and last. These should rest next to the Larks Head knots. Step 4: Drop cords 1, 2, 19, 20. This means you do not use them any more. 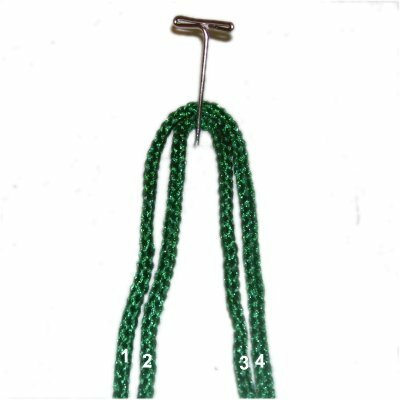 Tie ASK with cords 3 - 6, 7 - 10, 11- 14, and 15 - 18. There should be 1/2-inches of space between this row and the first row tied in step 3. Step 5: Drop cords 3, 4, 17, 18. 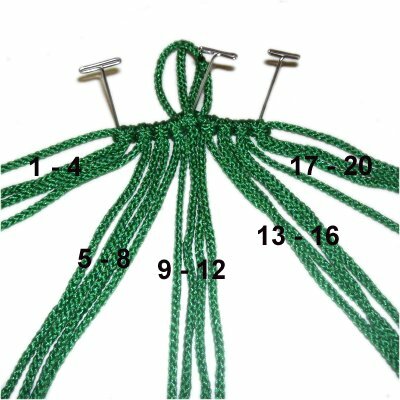 Tie the next row of ASK with cords 5 - 8, 9 - 12, and 13 - 16. 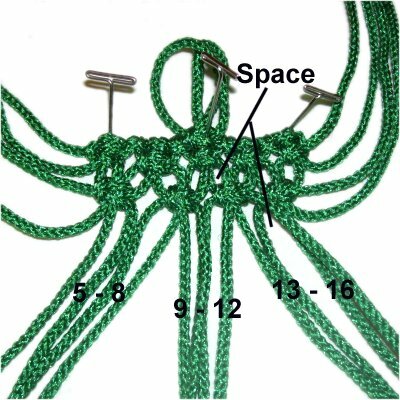 These knots should rest 1/2-inch below the previous row. Step 6: Drop cords 5, 6, 15, 16. 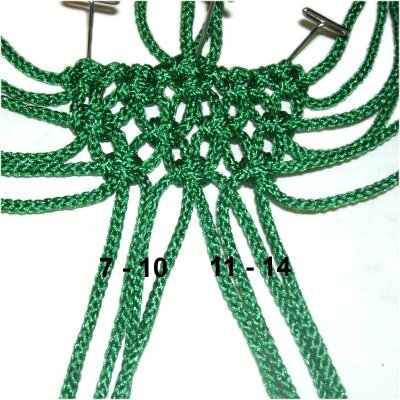 Tie the next row of ASK with cords 7 - 10 and 11 - 14. Don't forget the 1/2-inch spacing. 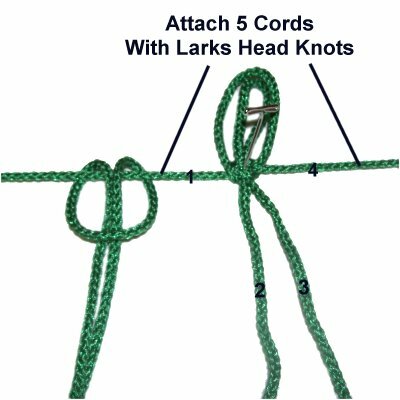 Step 7: The final ASK is tied with cords 9 - 12. Make sure it's 1/2-inch below the previous knots. 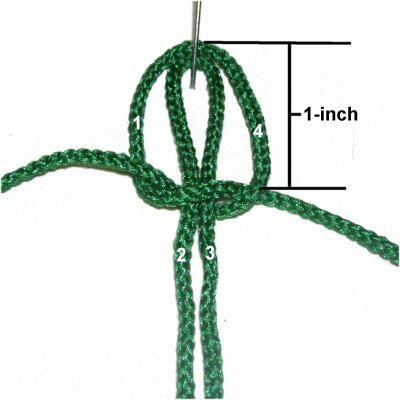 Step 8: Tie an Overhand knot with cords 10 - 11, arranging it so it's as close to the SK as possible. Step 9: Create the fringe along the edges of the Tree Ornament by trimming the cords to 1-inch. 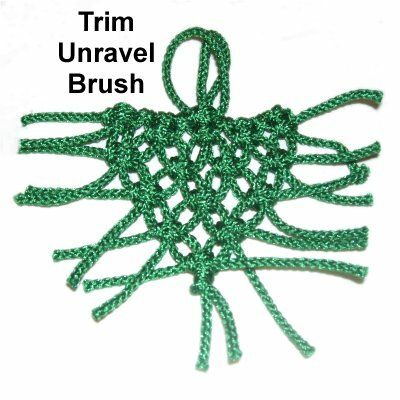 Unravel each one, then brush the fibers to create a soft fringe. You can trim the cords shorter if you wish. Have any comments about the Tree Ornament? Contact Me.